"21st-century CIOs have a dual responsibility: driving down costs and creating new business value. Managing this seeming dichotomy is the domain of top business executives everywhere, and CIOs everywhere are learning to step it up. The original research contained in Hunter's book serves as a practical road map for IT strategy in today's ultra-competitive markets." "This is a thoughtfully written book, and the timing is perfect. Hunter really understands the challenges confronting transformational CIOs in today's markets, and he captures the choices they face as they work to create value for their organizations while driving down the costs of doing business in the modern world. The wealth of information contained in this book makes it truly valuable to career IT leaders and future CIOs alike." "The cloud involves more than just technology. It's really more of a new business model. Hunter grasps the central truth about cloud computing, and that's why this is a valuable book. Hunter understands the issues and conveys them in a conversational tone that is truly refreshing." "You may think this is a book about technology; well it's not. It's a book about leadership, packed with stories about real leaders finding new customers and markets, transforming the way their organizations work, and adding valuewith the next generation of technology as the enabler. The cloud holds real potential. 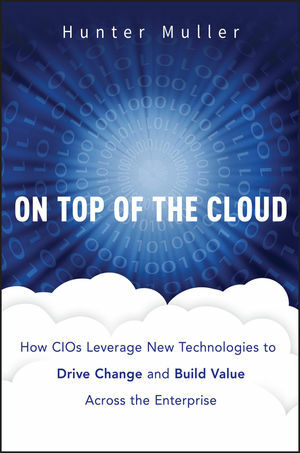 Read this book to see how top CIOs are positioning their companies." "Hunter has the unique ability to distill the best thinking of world-class CIOs into something you can act on. If you are a technology executive trying to find the right balance between generating business value and managing IT costs, this is the right book for you. On Top of the Cloud will be especially useful for transformational CIOs tasked with developing their company's strategies for technology-driven business growth." HUNTER MULLER is the President and CEO of HMG Strategy, LLC, a leading provider of networking events and professional services to CIOs and senior executives across the IT industry. HMG Strategy, LLC is the producer of world-class events such as the CIO Executive Leadership Series, which provides CIOs and senior executives with opportunities to learn from world-class thought leaders, share knowledge and best practices, and interact with peers and industry leaders representing a wide variety of dynamic markets. Muller has more than twenty years of experience in business strategy consulting with a strong focus on IT organization development, strategy, and business alignment.